In the end, we decided to put this concern aside. Our main objective was to train national instructors. The evening lectures our trainees would teach for the hosting church was an auxiliary part of our strategy, simply to give our future instructors practice in public speaking. You can imagine our surprise when, the week before our arrival, we began receiving messages from the church’s pastor asking us to increase the number of presentations to the local congregation. Apparently, God was moving, growing interest and excitement ahead of our coming. When we arrived that Sunday, we enjoyed fellowship with the church during the evening service, being warmly received by that body. On Monday evening, 37 church members came to hear our national instructors deliver their first lessons, listening intently for two hours as four trainees each taught a 30-minute lesson. When we dismissed for the evening, many came forward to talk further with our instructors. During the following three days, the evening seminars grew to 40 attendees and was typified by strong audience attention. 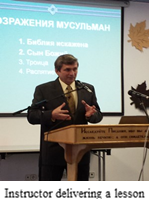 This church body now hopes to host further EWI training at its regional youth rally and is also praying about sending a short-term team to assist missionary efforts in one of Russia’s Muslim regions.